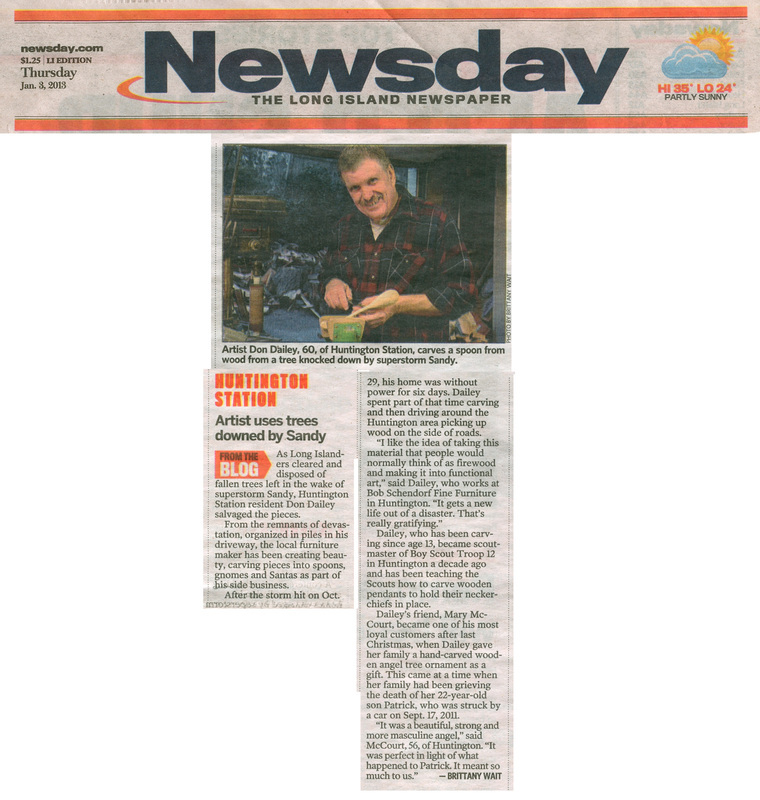 As Long Islanders cleared and disposed of fallen trees left in the wake of superstorm Sandy to remove any evidence of the storm, Huntington Station resident Don Dailey salvaged the pieces. From the remnants of devastation, which he organizes in piles in his driveway, the local furniture maker has turned destruction into beauty, carving pieces into spoons, gnomes and Santas. After the storm hit on Oct. 29, his home was without power for six days, half of which he spent carving and then driving around the Huntington area picking up wood on the side of the roads. 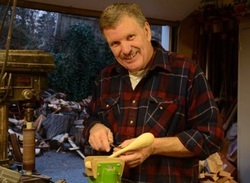 Dailey, who has been carving since age 13, became scoutmaster of Boy Scout Troop 12 in Huntington a decade ago and has since been teaching the scouts how to carve wooden pendants to hold their neckerchiefs in place. His wife, Diane Dailey, said her husband is a real renaissance man; besides his woodworking he has also composed music. Dailey’s friend, Mary McCourt, became one of his most loyal customers after last Christmas, when Dailey gave her family a hand-carved wooden angel tree ornament as a gift. This came at a time when her family had been grieving over the sudden loss of their 22-year-old son Patrick, who was struck by a car on Sept. 17, 2011. McCourt appreciated the gift so much that she kept on buying the wooden spoons and ornaments that were recycled from fallen trees in Huntington to give to her 80-year-old mother, whose home in Hampton Bays was damaged by both Tropical Storm Irene and Sandy. Suzanne Pelisson-Beasley, who has known Dailey for nearly five years, wasn’t aware of how talented her friend was until she received a black walnut coffee scoop he carved as a gift. Pelisson-Beasley was also easily won over by the idea of recycling the wood from fallen trees. My "Top 10 Tools" for woodworking has been listed on the Sears expert list. Visit the page here.